covers preschool and kindergarden curriculum. colourful design and beautiful photographs. printed on special polypropylene sheets . 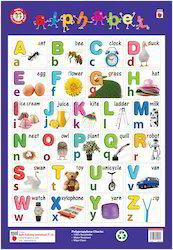 Alphabet chart offeredcomprise wipe clean charts that are made available in size options of 490 x 710mm and is carefully designed to cover preschool and kindergarten curriculum related to learning of alphabets. These beautifully designed and printed visual aid are also suitable for retaining the construction of alphabets in memory with its colorful design and beautiful photograph also making it a highly attractive option to use. We get these printed on special polypropylene sheets that are 100% recyclable as well as water resistant. 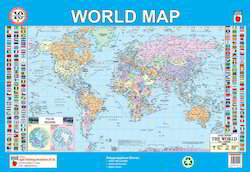 World Map comprise wipe clean charts that come in size of 710 x 490mm and feature printing on polypropylene sheets which make these water resistant as well as easy to clean by just wiping the surface. Covering preschool and kindergarten curriculum, these charts come in colorful design with support of beautiful photographs that makes children easily memorize different countries, continents and oceans that are part of this world. As a best tool for engaging child's interest in initial school years, these charts are great way to have fun while children get benefitted from practical, memorable lessons. 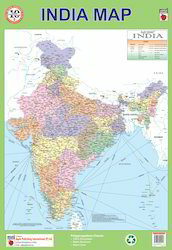 India Map chart offered comprise wipe clean charts that are available in size of 490 x 710mm and is designed to cover preschool and kindergarten curriculum. Coming printed on special polypropylene sheets, the chart is 100% recyclable as well as is scratch free while allowing easy and convenient cleaning support by wiping the surface. Being fun to work with, it is perfect choice for introducing children to early childhood lesson and are fun and instructional to go through. These are suitable for children in their initial schooling years. Looking for Wipe & Clean PP Charts ?